Wall Mount Computer Station features height-adjustable design. Electronically height adjustable, i-Center™ IR900-101 accommodates monitor on VESA-compliant mounting plates behind plexiglass cover; has self-closing keyboard tray; and can be ergonomically adjusted to proper and comfortable worker setting at touch of button. Optional electronic locks protect both equipment and sensitive data. Available in several colors and finishes, stations provideÂ ventilation for computer equipment and help prevent damage to computer caused by traffic in small spaces. As the prevalence of computers increases in schools, businesses, and medical offices, multiuser computer stations are the rule rather than the exception. These sleek, compact, computer stations can be mounted virtually anywhere that a computer is needed but a computer desk might be too bulky. • They help prevent damage to the computer caused by traffic in small spaces. • They are available in a multitude of sophisticated designs and finishes which portrays a professional image for your facility or business. • They provide easy access to systems and proper ventilation for computer equipment. • The fixtures can be strategically placed at locations that will reduce the users’ walking distances by about 50 to 80 percent. • Thanks to the ergonomic features, the wall mount computer station unit can be easily adjusted for different users of your work force. The most recent advancement for AFC Industries’ all-in-one i-Center™ IR900-101 mounting solution, is electronically height adjustable with a self-closing keyboard tray. Ideally suited for the thin client PC; the unit accommodates the monitor on VESA compliant mounting plates behind a plexi glass cover; has the self-closing keyboard tray; and can be ergonomically adjusted to the proper and comfortable worker setting at the touch of a button. Optional electronic locks protect both the equipment and sensitive data; it is available in several colors and finishes to match any décor. Since 1994, AFC Industries has been an innovator in the field of medical solutions. From ergonomic, high-quality workstations, carts and racks to complete modular storage systems, the company's product line is crafted for the ultimate in safety, adaptability, comfort and functionality. All products are constructed of the highest quality reinforced steel and may be customized to meet a full range of needs. Noted for its high level of customer service, AFC offers complementary room design analysis, three-dimensional designs, furniture customization and ongoing customer support. The company supplies furniture to a full range of medical facilities, airports, casinos, police, fire and many other emergency and control monitoring stations. AFC Industries, Inc. is located at 13-16 133 Place, College Point, NY, 800-663-3412. For more information e-mail afcsales@afcindustries.com or visit the Web at www.afcindustries.com. Ergonomic Workstation offers electronic height adjustment. 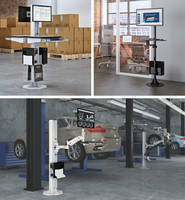 Integrated Imaging Workstation reduces RSI via ergonomic design.